Why Were My Freedmen Ancestors Split Between Tribes? My ancestor Billy Postoak (aka Taylor and possibly Perryman) was born about 1820 in Alabama and was a slave of Taylor Postoak (Creek Indian). He married a Lizzie Smith and they had a son named Isaac Nivens (born about 1840-1842) in Alabama. A slave schedule shows Isaac was a slave of Cherokee Indian John Nivens. Also, Billy Postoak was Creek freedmen and yet his son Isaac ended up being on Cherokee freedmen rolls. 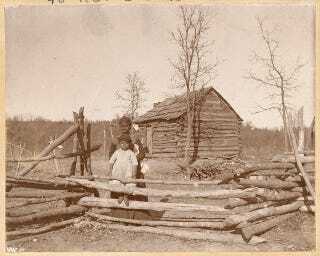 Your family’s history provides a window on the complex history between African Americans and Native American nations (namely the Cherokee, Creek, Chickasaw, Choctaw and Seminole) that were forcibly relocated from the American South and East to lands west of the Mississippi River during the 19th century. Prior to their removal, those nations had acquired the label of the “Five Civilized Tribes,” in part because they had adopted plantation farming, Western education, Christianity and slaveholding, among other practices. With the passage of the Indian Removal Act in 1830, nearly 50,000 Native Americans were relocated west along with the Africans they had enslaved. Many were forcibly marched to their new homes. The infamous and deadly Trail of Tears, a trek of over 1,000 miles, claimed 4,000-5,000 Cherokee lives. Following the Civil War, the five nations, all of which had members who fought for the Confederacy, entered into Reconstruction Treaty agreements with the United States. One of the concessions of these treaties was that the nations had to emancipate those they had enslaved and grant the “freedmen” tribal rights. The Cherokee, Creek and Seminole granted their freedmen tribal rights without any restrictions, whereas the Chickasaw and Choctaw each gave freedmen the option of adoption into the nation or removal from the area to settle elsewhere. Because of the 1866 treaties, freedmen were granted membership into the nation under which they were previously enslaved. The rolls to which you referred in your question, officially known as “The Final Rolls of the Citizens and Freedmen of the Five Civilized Tribes in Indian Territory” but commonly called the Dawes Rolls, recorded membership in the five nations between 1898 and 1906. The kind of information they contain include name, age, gender, blood degree (pdf) or certified share of tribal ancestry, census card number or page, enrollment number, and the name of their nation. Therefore, the Dawes Rolls your ancestors appear on have more to do with the enrollment of their former owners prior to the end of slavery than their lineage. This explains why a father and son would appear on rolls for two different nations. Isaac Nivens appears on the Cherokee rolls because he was owned by John Nivens, who was a Cherokee. Since Isaac’s father, Billy Postoak, was owned by a Creek, he would have been included in the Creek rolls. Maintaining membership in Native American nations has not been without its challenges for the freedmen’s descendants. The status of many Cherokee freedmen’s descendants was cast into legal limbo after a 2007 revision to the Cherokee constitution made a requirement of “Indian blood” for citizenship. What ensued was an ongoing legal battle between the Cherokee Nation and the Cherokee freedmen to address the membership of the freedmen in the tribe, one that has pitted charges of racism against claims of sovereignty. You can use the Dawes Rolls to learn more information about your ancestors and their owners. According to Isaac Nivens’ enrollment card, his father was Billy Postoak, who was owned by “Postoak,” and his mother was Lizzie Smith, who was owned by John Smith. Both of Isaac’s parents were members of the Creek Nation, according to the enrollment card, even though Isaac was enrolling as a Cherokee. This is because he was previously the slave of John Nivens, who was a Cherokee by blood, so he was eligible to enroll as a Cherokee freedman upon his emancipation. When examining the Dawes Rolls, never stop at just the final roll. The applications have much more detailed information about the applicants and their families, even if they were not accepted onto the Dawes Final Rolls. There is a packet for Isaac Nivens with more information on him and his family. Isaac’s application questionnaire (available on Fold3.com; subscription required) is dated April 4, 1901, and he applied for the enrollment of himself and one of his children (Henry) as Cherokee freedmen. According to the responses to the other questions, at the time of the application, Isaac’s wife, Louisa, was deceased and he had five children. His application also states that his former owner was John Nivens, who was a Cherokee citizen, that Isaac lived in the Choctaw Nation at the beginning of the Civil War and that he was in the Cherokee Nation by the time of the treaty. It is possible that he was sold during the war, though he does not mention any previous owners in his application. You may also be able to gather more information about Billy Postoak, his son Isaac Nivens, and their former owners by examining the Dawes packets and enrollment cards for other family members. For example, there is an application for John and Jack Perryman dated May 18, 1901, in which Robert Grayson, a member of the Creek Nation, claimed that Billy Perryman (the father of the applicants) was a Creek freedman whose father was Billy Postoak. Billy Postoak and Billy Perryman’s former owner was Taylor Postoak. According to the final decision of John and Jack Perryman’s application, their father was Billy Perryman, who was a citizen of the Creek Nation, and their mother was Mary Carson, who was a recognized citizen of the Cherokee Nation. Based on this, it seems likely that Billy Perryman was a brother to your Isaac Nivens. You had mentioned in your question that Billy Postoak was sometimes known as Perryman; perhaps the records you located with the name Billy Perryman are actually describing his son. There is a good deal of information available about Taylor Postoak, who was a Creek leader with the title of “second chief.” A photograph of him is included in his article on Find a Grave, along with his gravestone. There is also a published version of The Corn Fable of the Creeks as told by Taylor Postoak in 1882, so you can read the tale in his own voice. In addition, his son, Lincoln Postoak, provided an oral history of his father that gives a good description of others in the town. Though this account does not mention any of his former slaves, you’ll want to note some of the familiar names in his recollections, such as Perryman, that may provide some hints and clues on where to look for more information. As you search records, try to see if you can locate something that connects the Postoak and Nivens families that could give you a better idea of the time frame in which your Isaac Nivens was sold to John Nivens. Keep in mind that you probably will not locate a deed of sale for any of the Postoak slaves to John Nivens, since these were sovereign nations and their property exchanges may not have been recorded by any U.S. governmental entities. You always have the option, however, of reaching out directly to the individual nations involved. Since you know that John Nivens was the owner of Isaac Nivens, you can begin to search for more information on him in the United States Slave Schedules (available on Ancestry.com, subscription required). In the 1860 Slave Schedule, a slave owner named John Nivens was residing in the Canadian District of the Cherokee Nation. With his location, we were able to locate him living in that district in the 1886 Cherokee Census. According to this, John was born about 1819 and his wife was named Delilah. There were also others in his household, including a Josephine Nivens (born about 1854), Ella Nivens (born about 1876) and William Nivens (born about 1881). Based on William Nivens’ application for enrollment, he was the son of Josephine and the grandson of John Nivens. The files for John Nivens’ family members in the Dawes Rolls and Allotment applications can reveal a bit more about John Nivens. The application for his daughter, Josephine Higgins, reveals that John Nivens was Cherokee by blood, but his wife, Delilah Nivens, was Creek by blood. According to depositions in her file, the family lived on the border between the Cherokee and Creek nations, and John Nivens had enrolled all of his children in both the Cherokee and Creek nations. This makes sense for what you know about your own ancestors that have ties to both nations. According to one of the depositions in the file by Joshua Ross, John Nivens and his family were “well to do” and John Nivens had a house on the Cherokee land, a part of which Josephine inherited upon her mother’s death. Sometimes, examining histories written about the tribal nations may reveal specific information about the individuals in questions. According to a book by Emmet Starr, A History of the Cherokee Indians and Their Legends and Folk Lore, John Nivens served in a company in cooperation with the Confederacy and was killed at the same time as his commander, Lt. Col. Thomas Fox Taylor, on Greenleaf Bayon, July 21, 1862. This would mean that he died before the end of slavery, which, in other circumstances, may help you find a probate with a slave ancestor listed. However, since John Nivens was Cherokee, you are less likely to find a probate record at that time period. Your best option for discovering more about your ancestor’s family and time during slavery would be to examine as many of the Dawes applications for your ancestor’s extended family and the family of their former owners as you can. The accounts in these records may reveal more about the settlement of the families over time.